The best way to keep smoke and toxic gases from spreading throughout a building is through containment, essentially dividing a building into “boxes” to protect occupants as they exit the building. One element of containment is firestopping. What is firestopping? Perhaps the easiest way to explain it is to describe what it is not. It is not draftstopping, which restricts the movement of air in concealed locations of combustible construction. It is not fireblocking, which is used in concealed locations in combustible construction to resist the passage of flame to other areas. Nor is it foam insulation, which has been used in combustible construction in conjunction with fireblocking. Firestopping itself is a component of a system, most often associated with a through-penetration firestop system. A through-penetration firestop system comprises three elements: a fire-rated assembly, be it a wall or a floor; a penetrating item, such as a sprinkler pipe; and the firestop material. These systems are tested per ASTM E814, “Fire Tests of Penetration Firestop Systems,”1which determines the performance of a firestop system with respect to exposure to a standard time-temperature fire test and a hose-stream test. The performance of the system is dependent upon the specific assembly of materials tested including the number, type and size of penetrations and the materials of the floors or walls in which it is installed. 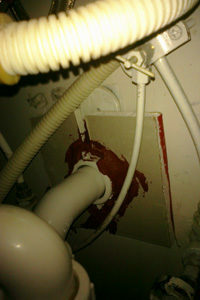 This demonstrates proper installation of through penetration firestopping. Photo courtesy of Eirene Oliphant. The difference in this example is either the rating of the wall, or having just under four minutes to escape. Since smoke and toxic gases are the leading killer in fires, the proper installation of firestopping makes the difference between an escape time of less than four minutes and two hours. Unless you install firestop systems exactly as their listing details, they will not perform. How can you correct this problem? The first step is to address problems that occur in the field. The following is a list of situations which may present themselves in the field not only to the general contractor, but also to the authority having jurisdiction or other agency performing inspections on firestop systems. This is an example of where the fire-caulking material has not been properly tooled as the material has not been evenly distributed around the opening. The first opportunity to address potential firestopping issues is at the plan-review stage. The plans examiner can review the plans for various penetrating items and require that the plans include listing details for those penetrating items. If for some reason the plan does not provide this information, it is often left to the inspector to address in the field, when the work has already been completed and the system is more difficult to inspect as well as more difficult to access from a design perspective to determine the appropriate listing detail. 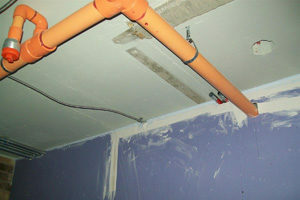 Combustible products such as plastic piping are generally not permitted in noncombustible construction However, the International Building Code (IBC) allows combustible products within noncombustible construction, provided it is in a concealed location.3 One needs to consider the location of the penetration in order to determine whether you can use combustible products. In addition to the “F” (flame occurrence) and “T” (temperature rise) ratings required by the IBC for fire-rated assemblies, smoke assemblies must restrict the movement of smoke. 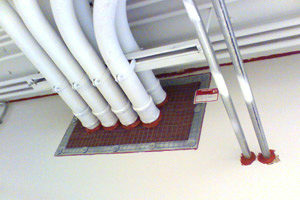 The listing for the penetration to be firestopped must reflect that rating through the air leakage rating, “L.” Some design professionals may also require that walls be rated for watertightness, “W.” Those penetrating items must be listed to include those required ratings as well. In addition to through-penetration firestop systems, both the top and bottom of the wall must be firestopped. This can be achieved through the use of “head-of-wall” and “floor-to-wall” joints. 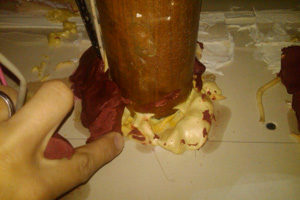 Did you know that some firestop materials intumesce or expand when exposed to heat? Intumescence occurs most often with products which can melt or change their shape in a fire, such as plastic pipe. Intumescent materials can expand up to 25 times their initial volume. If the correct fastener schedule is not followed, the intumescent material is not held in place, allowing fire, smoke and gases to breach the barrier. The tested and listed system will state the specific orientation of the packing material, such as mineral wool. Mineral wool is a layered product and a key component of firestop systems. Simply stuffing in a wad of mineral wool or placing it in an incorrect orientation will cause system failure. Here is an attempt to use an expansive foam insulation as packing material. Products with a high flame spread definitely would not be an approved packing material. The tested and listed system specifically states the manufacturer and the exact products that may be used. There is NO substitution, as each product has different properties; and these specific combinations and applications are what have passed testing. Many times a system is installed using a different manufacturer, the wrong firestop product or a different brand of insulation. For instance, combining an STI system with 3M firestop materials would not be acceptable. Firestop materials are some of the most expensive materials per ounce on the job site and typically cost many times more than labor. The tested systems created by the manufacturers represent the minimum amount needed. Metallic and nonmetallic in same penetration. Because of the difference in physical properties of metallic and nonmetallic piping, firestopping materials do not behave the same. Nonmetallic piping will melt when exposed to fire, thus requiring a firestopping material which will expand. 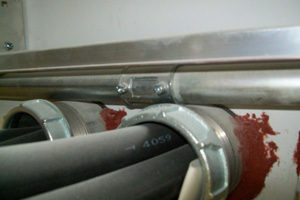 Metallic piping conducts heat and needs a firestopping material which will help to dissipate the heat. Insulated-pipe firestop systems require insulated pipes to be treated with a firestop material inside the wall cavity between the penetrant and the periphery of the opening. Be sure to check the listing as some systems allow for a zero annular space with a small bead of material around the penetrant, while others require an annular space and thus more firestop material. There are a variety of insulation materials allowed as the packing material component of the firestop system. Those materials include ceramic (alumina silica) fiber blanket, foam backer rod, foamed silicone, glass fiber and mineral wool. Both glass fiber and mineral wool have varying weights; and the listing detail will note the weight needed to meet the listing. As nonmetallic pipe surpasses the three-inch mark, in general, a simple caulk system is insufficient. Check the system. Some systems require a collar for nonmetallic piping, while others do not. Check the system. UL 1479 “Fire Tests of Through-Penetration Firestops”4 has a new testing requirement related to systems contained within a cavity, which creates a chase effect on pipe within wall. Check the system, as some include provisions for penetrations with a chase wall being optional. Membrane penetrations are treated similar to through penetrations. As a general rule, electrical outlets can meet firestopping requirements through the use of a putty pack and be separated by a distance of less than 24 inches, provided the outlets are not back-to-back. The size of the outlet allowed to be protected with the use of a putty pack varies depending on the material of the box (metallic or nonmetallic), the depth of the box, and the rating of the wall/ceiling assembly. Exceptions for firestopping of membrane penetrations exist for outlets that are less than 16 square inches and contribute to less than 100 square inches of openings within any 100 square feet of wall/ceiling area. Outlets on opposite sides of the wall must be separated a horizontal distance of at least 24 inches. The annular space between the wall/ceiling membrane and the box cannot exceed 1/8 inch. There currently exists a very limited number of tested and listed systems that allow penetrants to be installed through a head-of-wall joint. The tested and listed system will state the exact maximum fill percentage. Systems range from as little as 11-percent maximum fill up to 100-percent fill. In general, a sleeved opening at over 40 percent capacity is cause for further examination. Here are several items which have penetrated the head of wall joint with no protection of the opening that has been created. Cables should be evenly distributed within the trays and should be treated similar to cable bundles for fill. Installing a five-inch-deep cable tray when the prescribed firestop system is designed to work with a cable depth of three inches will cause the firestop system to fail. These joints occur where the rated floor slab edge meets the non-rated exterior curtain wall. and must be protected against the passage of smoke and gases through the associated void. Because heat rises, positive pressure occurs at the ceiling line, rendering this area susceptible and providing an area for smoke and gases to pass through. This is also referred to as the “leap frog” effect. Not all materials used in listings are red. Some are white, and some are green. Be sure to check the listing for the approved and tested material. Cast-in-place devices are designed and tested for very specific type and size of penetrants. A three-inch PVC pipe through a four- or six-inch cast-in-place device is not an approved, tested and listed system. In an atypical environment, i.e., one with high moisture or where chemicals are in use, typical products generally do not work. Have the contractor produce MSDS and check for reactivity. Just as galvanic action occurs when copper and steel come into contact with each other, similar chemical reactions can occur between firestopping materials and the penetrating item they are intended to protect. Ensure the listing for the approved and tested materials is followed. Engineering judgments come into play when a condition exists in the field which differs from the original design or some other item creates a hindrance that cannot be easily corrected through redesign or reconstruction. Because the situation in the field is not based on the identical design which was tested, the engineered judgment must be based on internal test data and existing firestop systems. Engineering judgments should be specific to a single job and should not be transferred to any other job without a thorough review of all aspects of the new job. Generally, engineering judgments are issued by the manufacturer, a knowledgeable registered fire professional engineer or an independent testing agency. Not only is the paper contained in the opening not permitted, this photo represents a sleeved opening at more than forty percent capacity. Clearly, there is quite a lengthy list of items which can result in problems with the installation of firestopping materials. While this is not an all inclusive list, any one of these items can contribute to a two-hour wall being reduced to a four-minute wall. For an inspector, one of the easiest ways to avoid problems in the field is to ask the installer for the tested and listed system utilized. A plans examiner should ask for the jurisdiction-approved plans to include details for all the proposed systems that could be encountered on the project based on the materials being used and the assemblies being penetrated. As a code official, it is imperative to have a comprehensive understanding of firestopping and the importance of properly enforcing it to ensure life safety, not only for those occupants of the building, but also for the fire service personnel who may be responding to the call. 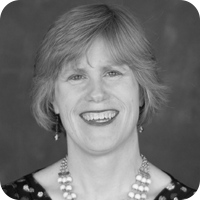 Eirene Knott is the director of code services for BRR Architecture, which provides consulting, third-party inspection services and educational services to the design and construction communities. She has more than 25 years of experience in the arena of codes administration and maintains more than 25 International Code Council certifications, including certified building official, certified fire marshal and master code professional.